NEW YORK (AP) — Don’t tell 20-year-old Nestor Aguilera he can’t effect change in politics. The Indiana University business major protested outside President Donald Trump’s recent appearance in Aguilera’s home of Elkhart, Indiana. And while he says he didn’t vote in 2016, he’s promising to show up for this fall’s midterm elections. Aguilera is among a small — but significant — surge of young people who say they feel politically empowered in latest Youth Political Pulse survey from The Associated Press-NORC Center for Public Affairs Research and MTV. It’s a change from a past survey that comes after a school shooting in Florida that elevated the voices of high school students in American politics, and five months before Americans will decide whether Trump’s Republican Party will maintain control of Congress for another two years. A slim majority, 54 percent, of people ages 15 to 34 — a group that is typically the least likely to vote — continue to believe they have little or no effect on government. But 46 percent of young people now believe they can have at least a moderate effect, a significant increase from two months earlier, when 37 percent said the same. In that time, a group of students from Florida’s Marjory Stoneman Douglas High School, where a February shooting killed 17, has succeeded in keeping the debate about gun safety in the news. They joined Tuesday with the New York-based organization HeadCount in an effort to hold voter registration drives at 90 percent of the nation’s high schools before this year’s senior class graduates. It’s one of the many efforts by organizations aligned with Democrats on gun control that seeks to capitalize on the increase in interest among young people in politics. The recent rise in political engagement is particularly apparent among Americans ages 15 to 22, a group that includes teenagers who will be eligible to vote in a presidential election for the first time in 2020. The poll found that 48 percent now think they can have at least some effect on the government, after just 33 percent felt that way in March. There’s also an uptick in the number of young people who say politicians care what they think: 34 percent of 15-to-34-year-olds report that elected officials care at least a moderate amount about what they think, while just 25 percent said so two months ago. At the same time, two-thirds say they think the government is not functioning well, and just over half — 52 percent — say they rarely or never read or watch news about the midterm elections. While many young people continue to feel powerless in the current political environment, the modest increases revealed in the poll could be further evidence of a Democratic wave building against the GOP this fall. Young people are far more likely to side with Democrats than Republicans. The new poll finds that they are also especially likely to have concerns about the Republican president. Just 30 percent of people ages 15 to 34 approve of Trump’s job performance, the poll found. In April’s AP-NORC survey of all American adults, 40 percent said they approved of the president’s work at the White House. On gun control, 4 in 10 teens and young adults give the government an F grade on addressing the issue. Still, gun-related issues have fallen on the list of concerns for young adults since the first Youth Political Pulse survey, which was conducted just after February’s school shooting in Parkland, Florida. Just 6 percent now list gun laws as their single top concern facing the country, down from 21 percent in March. At least 4 in 10 young people in the latest poll also give the government failing grades on handling immigration, environmental issues, racism and higher education costs. One poll respondent, 21-year-old Samantha Bitzer, a political science major at Michigan State University, says she’s determined to encourage her friends to engage more in politics. Despite the rise in engagement, it’s far from certain that young people will reshape the political landscape this fall. Young voters, with few exceptions, have struggled to maintain interest in politics over the last half century. Just 15 percent of eligible voters ages 18 to 20 cast ballots in the last midterm election, for example. “Maybe I’d feel differently if I were still in high school,” she said. 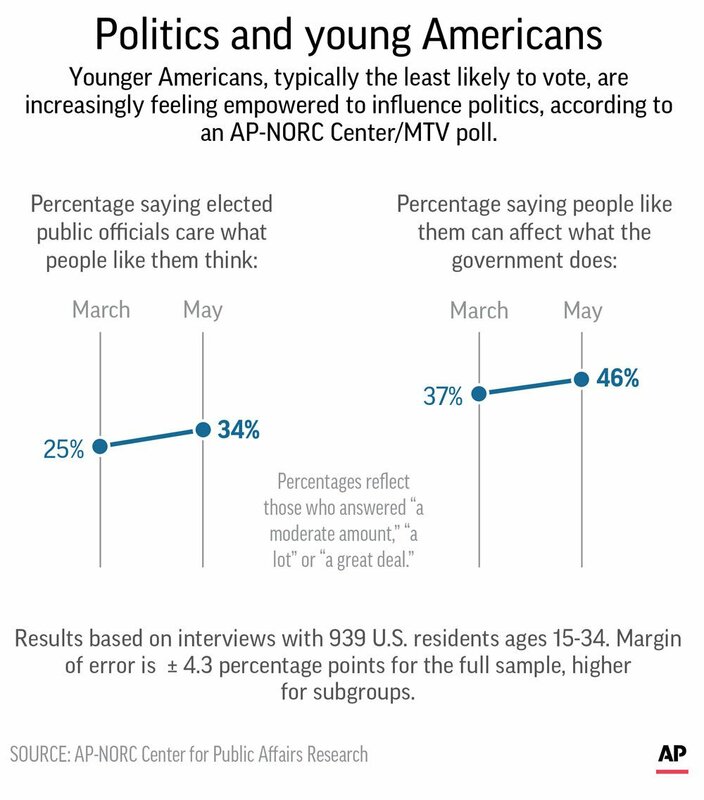 The Youth Political Pulse poll of 939 young Americans ages 15 to 34 was conducted April 23 to May 9 by the AP-NORC Center and MTV. The poll was conducted using NORC’s probability-based AmeriSpeak panel, which is designed to be representative of the U.S. population. The margin of sampling error for all young people is plus or minus 4.3 percentage points. Graphic shows results of AP-NORC Center poll on young adult attitudes toward poltics and politicians.